Guest post from Hillsborough County resident and small business owner Tim Curtis. Who among the "Transit Tax Hike supporters" will tell the whole truth about Vinik's transit tax hike petition effort to raise the total sales tax rate in Hillsborough County to 8% - the highest in the state? The so-called “one penny” or $.01 increase isn't a "1%" or even a 14+% increase. This is a county levied tax hike. 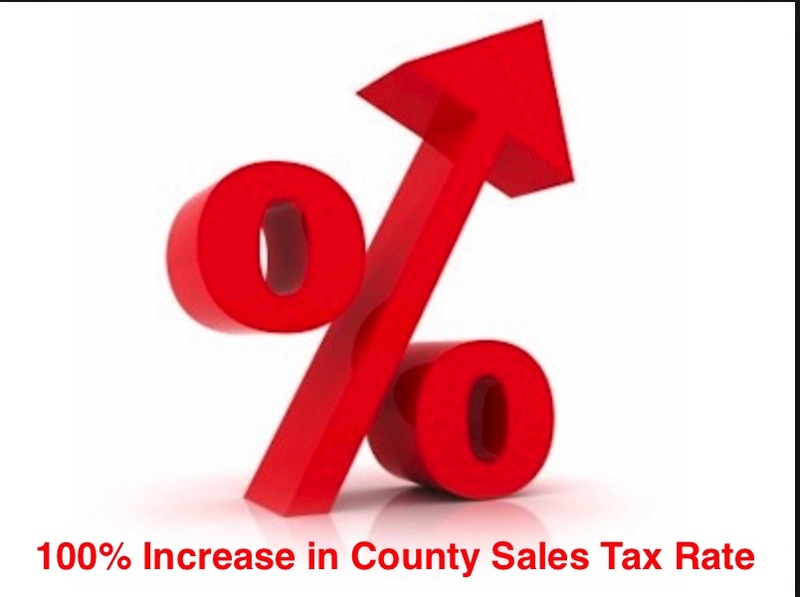 It is a 100% INCREASE in the COUNTY Sales Tax Rate. As a small business owner, the current state sales tax rate I must collect and remit to the state is 6%. The other 1% of the current 7% total sales tax rate collected is the county sales tax rate. It does not take a rocket scientist to understand that an increase from 1% to 2% is a 100% PERCENT INCREASE. The transit tax hike will DOUBLE the county's sales tax rate with the vast majority of the 100% increase in the county sales tax revenue paid by taxpayers in unincorporated Hillsborough. Local media, including Sue Carlton and others at the Vinik bailed out Tampa Bay Times, continue misleading the public that this is a “one penny” tax hike. Nothing can be further from the truth. Instead of this “mad dash” to unnecessarily take an additional $15-18 BILLION out of taxpayer pockets, the mad dash should be insisting elected officials properly prioritize the current and growing county revenues. Ensure our county roads, neglected for almost a decade, are fixed first and then lets talk about where additional transportation funding is needed. Two years ago, the BOCC-appointed Citizens Advisory Committee (CAC) diligently examined the county budget. They prepared a report, unanimously approved by the bipartisan CAC, containing recommendations on the budget. The CAC meticulously identified $3 BILLION in potential savings. Why is there a “mad dash” to unnecessarily increase the county sales tax rate 100% instead of a “mad dash” to examine whether the identified potential savings in other areas of the county budget can be used to fund transportation? Hillsborough County and the local economy is growing – both resulting in booming revenues unanticipated a few short years ago. I personally know the misleading talking points being used by those gathering petition for the 100% county sales tax rate hike petition effort. Last week at my place of business, I was approached by a nice young lady who asked if I would “sign her petition”. I engaged her in conversation and learned she had only recently relocated to Tampa from out of state and was doing this work to earn money. I applaud her for that and assume a temp agency is being used to hire paid petition gatherers. However, I asked some very pointed but polite questions about the petition and she told me she was told “it is a one per cent increase”. When I questioned her again and showed her the math questioning how that can be, she assured me that she was told “one per cent”. Obviously, people that was hired to gather the transit tax hike petitions know nothing about Hillsborough County or the transportation issue. The city of Tampa power brokers behind this Vinik and associates funded transit tax hike petition effort are being dishonest and intentionally using misleading information to deceive taxpayers and voters. But are you getting a 100% raise or revenue increase next year? If not, then why should the county? Especially a 100% county revenue increase that will greatly benefit Vinik, his Under Water Street development and the city of Tampa…but will be paid for on the backs of taxpayers in unincorporated Hillsborough. Eye Note: There is another citizen led transportation funding proposal that does NOT require any massive 30 year sales tax hike. Fund Transportation and No Tax Hike Is Needed! Voters and taxpayers deserve to hear both proposals and be fully informed. Unfortunately biased local media is suppressing information and intentionally shutting down any other proposal so they may cheerlead for Vinik's massive transit tax hike. Agree with you on all points in this story, Sharon. However, you have to address the increasing unaffordability of car ownership (even it is the result of overall expenses increasing faster than incomes), the terrible fundamentals of oil (increasing costs of production, decline rates of shale wells, and the monetary losses involved in non-conventional oil), and the high expense of continually widening roads. Those factors combined point to a limited future of driving ourselves around.